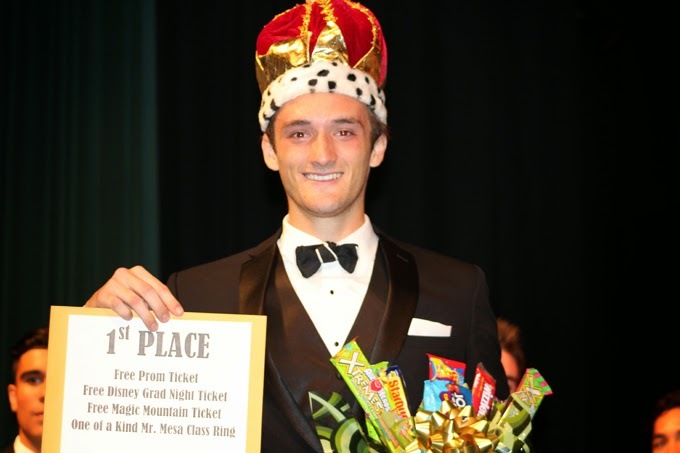 Murrieta Mesa High senior Cody Piche is all smiles and shows off his list of winnings at the Mr. Mesa competition Friday night. Who says talent and "beauty" competitions are only for the girls? 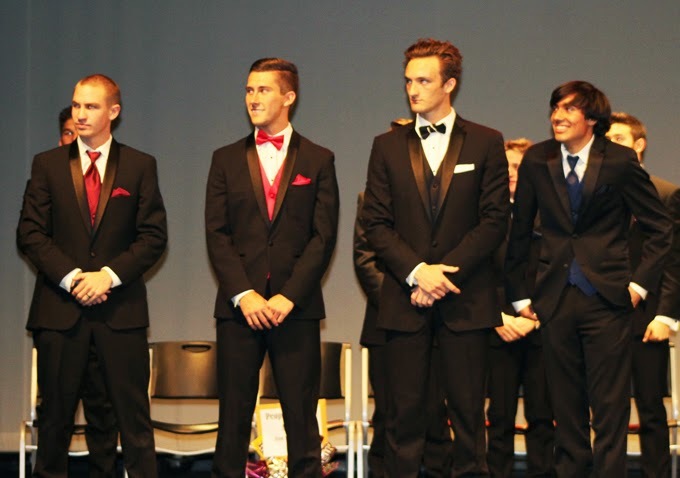 At Murrieta Mesa High School, an annual tradition is the Mr. Mesa contest, where male students compete for fun and accolades. Contestants are judged by audience members and a panel of judges in several categories, including formal wear, "pickup lines", swim suits, talent and an interview with the finalists. The competition has become so popular that Murrieta Valley and Vista Murrieta high schools have started their own "Mister" competitions. Finalists from all three contests will compete against each other April 17 at Murrieta Valley for the coveted "Mr. Murrieta" title. 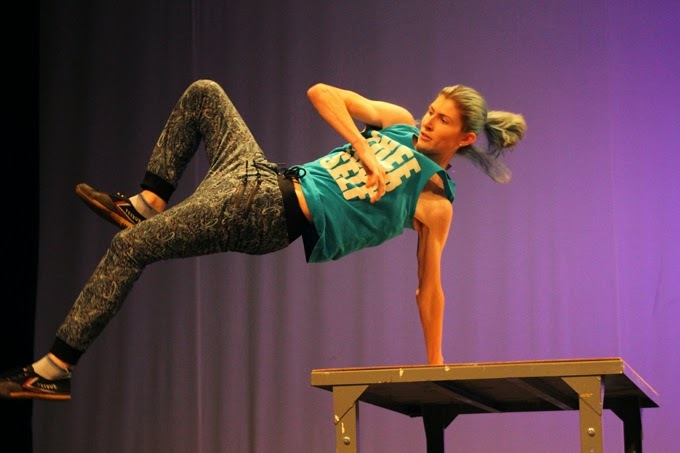 Senior Cody Piche won Friday night's competition in the school's Performing Arts Center, impressing the judges with his appearance in formal and swim wear as well as his quirky dance routine. Piche (pronounced Pee-SHAY) beat out runner-up Tristan Alderson for first-place honors to the cheers of the hundreds who attended. Brandon Geston and Tyler Amoy also finished in the top four and will advance to the Mr. Murrieta competition. "I'm speechless right now," said Piche, who was surrounded by his parents, Scott and Stacy, and his sister Zoe in the celebration afterward. "When my name got called, I couldn't stop crying. I'm shocked. This whole experience was amazing." 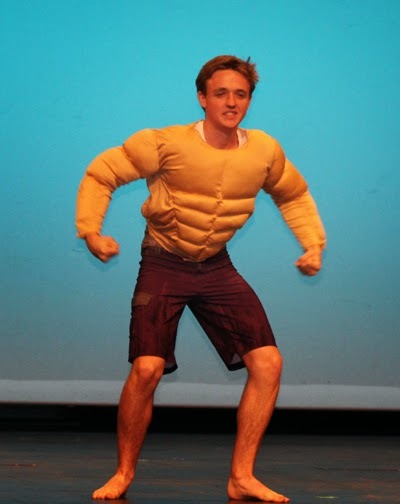 The contestants displayed a sense of humor (witnessed by Boomer Rawlings' "swim suit physique", left) as well as professionalism in the performance, which was under the direction of a staff led by Erin Moran, the school's activities director. Talent acts ranged from song and dance to a trumpet solo, guitar, rapping, a lip-sync battle and a display of artwork. Kerry Benz displayed his talents in parkour, a type of rhythmic and skillful movement in and around obstacles (below). Gage Northcutt performed a dramatic monologue. Geston recited a touching poem he wrote. Those in the audience were invited to share their comments on Twitter during the performance and to vote for their favorite contestant via text message. Funds raised through admission costs will be used to support school activities. For a gallery of additional photos from the competition, visit our Facebook page. Anyone wishing print copies of our story or any photo displayed here or on Facebook may order them by emailing murrieta247info@gmail.com.